ClockWatch can be used to get the time from timeservers that communicate via the "Time" (or "netdate") time protocol. 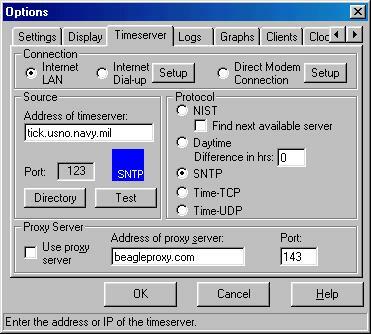 Set the Protocol selection to "Time-TCP" or "Time-UDP." Fill in the address of the Time timeserver (i.e., mytimeserver.net) or press the Directory button to choose from the list. ClockWatch can then be used to sync up with any Time timeserver that follows the standard Time conventions. This RFC specifies a standard for the ARPA Internet community. Hosts on the ARPA Internet that choose to implement a Time Protocol are expected to adopt and implement this standard. This protocol provides a site-independent machine-readable date and time. The Time service sends back to the originating source the time in seconds since midnight on January first 1900. One motivation arises from the fact that not all systems have a date/time clock, and all are subject to occasional human or machine error. The use of time-servers makes it possible to quickly confirm or correct a systems idea of the time, by making a brief poll of several independent sites on the network. This protocol may be used either above the Transmission Control Protocol (TCP) or above the User Datagram Protocol (UDP). The server listens for a connection on port 37. When the connection is established, the server returns a 32-bit time value and closes the connection. If the server is unable to determine the time at its site, it should either refuse the connection or close it without sending anything. The time is the number of seconds since 00:00 (midnight) 1 January 1900 GMT, such that the time 1 is 12:00:01 am on 1 January 1900 GMT; this base will serve until the year 2036. -1,297,728,000 corresponds to 00:00 17 Nov 1858 GMT.